Is that rod review all I need to know? Skip April 25, 2017 FEATURE STORY, Slide No Comments on Is that rod review all I need to know? Kirk Deeter, editor of Trout Magazine (Trout Unlimited) and Angling Trade’s editor – fly fishing industry’s retail magazine. How to narrow down my choices without leaving anything out? Settling on a budget? Knowing what the rods life’s work would likely be – what I was buying it for in the first place? And just who is warrantying the fly rod for a lifetime? Enron? 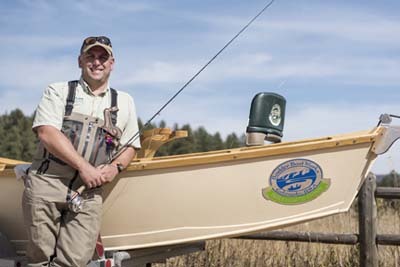 I knew I could trust certain fly rod reviewers, ones with earned credibility like Capt. Andrew Derr (our editor), Kirk Deeter, Louis Cahill, Kelley Galloup, Zach Mathews, George Anderson (Yellowstone Angler), Gary Merriman (Fish Hawk in Atlanta), and Red’s Fly Shop in Washington State. There are others. Will these reviewers have some prejudices? Yup, they’re all human. A product reviewer’s job is to critique and tickle interest – factually (weight, tapers, rod flex, and other technicalities). But reviews can cause false positives. For example, a reviewer may claim a putter will do such and such, but it won’t for you – claim a Wilson model Q tennis racquet strung at X-pounds will improve your volley… well, maybe not for you. And so it is with any absolute about a fly rod. There are indications in good reviews that are very helpful, such as a rod being universally deemed slow action when lined with an X fly line. That is not a maybe or a prejudice but a factual report. If a review states that the rod’s fit and finish is sloppy, you can be assured that it is. If there are concurrent reviews about a new rod and it’s called a world beater, I’d buy into that – put it on my list for a road test. When only the subtleties of a rod’s performance are the grist of a rod review, I’d have my doubts and consider wiggle room if intrigued. For example, are the reported negatives, negatives to you? Does the reviewer not like the rod only because the manufacturer called the action medium fast and it’s actually a full flexing rod? That rod’s reported performance as a negative may be just what you’re looking for in a fly rod. NOTE: When thinking about buying a fly rod, the fly line selection you’d prefer and the employment you plan on for that rod would be a couple of other things that must be considered and must gel for you. A reality is that any fly rod could be massaged into performance characteristics far from the design intent if given new suits of clothes. For example, how many reels, fly lines, leaders, and fly combinations are there? Think in the thousands. Each new combo possibility changing the rods performance either majorly or just subtlely. Montauk’s saltwater magic stick. Photo courtesy of Rise Fishing Company. You cannot fish stripers in Montauk for a season with Rise’s Level X, Nor’easters’ favorite striper flyrod, divorce it, and get a new, different model for free. That’s not going to happen no matter your fly rod companion’s parentage. Your new fly rod is not an affair; it’s for a lifetime you are committed to (just as the warranty says it is). The only true marriage proposal should come after courtship under the watchful eye of a seasoned fly shop guy or gal with credentialed casting skills, or a friend guide with same. At Red’s Fly Shop in Washington State or here in Atlanta at Fish Hawk (big fly shops) you can call and make a casting tryout appointment. After that hour or so of enjoyment and discernment, make a schooled decision. Your local fly shop, although smaller, will welcome your interest in a new fly rod and be just as helpful as Red’s or Fish Hawk. Don’t turn your nose up on a used fly rod. Do not turn your nose up on a rod that was the darling of a major manufacturer four years ago. You know, the one sitting in the fly shop corner all by itself and marked down 50% off of $795. Lastly, if a fly rod feels good in-hand, casts well on the lawn, buy it. Trust yourself. NOTE: Featured Image Madison River in Montana, courtesy of Slide Inn. Capt. Andrew Derr . . .
Yellowstone Angler . . . Fish Hawk . . .
Kirk Deeter . . .
Louis Cahill . . .
Kelley Galloup . . .
Zach Mathews . . .